Explore and learn the special techniques of Gond painting from accomplished Pardhan Gond artist, Rajendra Shyam. The Pardhan Gonds of Madhya Pradesh have developed their own unique style of indignenous art to preserve and share their rich storytelling heritage. You are invited to join a workshop and learn the special techniques of Gond painting from accomplished Pardhan Gond artist, Rajendra Shyam. Rajendra Shyam was born in 1974 in the remote village of Patangarh, in the jungle of eastern Madhya Pradesh, central India. As a child he was compelled to give up his education so as to help support his family. 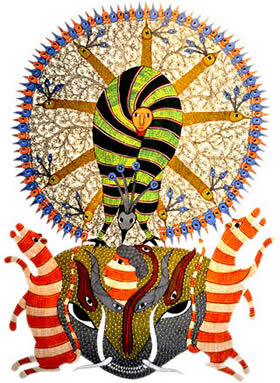 In 1996, his uncle – the seminal Gond master artist Jangarh Singh Shyam – recognized Rajendra’s artistic talents and encouraged him to work as his apprentice in Bhopal. He has subsequently pursued his own career as an independent artist. Rajendra has participated in many exhibitions internationally including being part of the Usurp launch exhibition. He is currently exhibiting his work at the Horniman Museum in London. Rajendra draws inspiration from his memory of traditional stories, learned during his rural youth and childhood. It was then that his artistic talents were first recognized by his family and community, who admired his renderings ofdignas – auspicious designs painted on walls and floors. Since moving to Bhopal he has adopted modern media, especially ink on paper and acrylics on canvas. His wife Sushila often assists him in filling in the details of his work, a practice customary among Pardhan Gond artists.